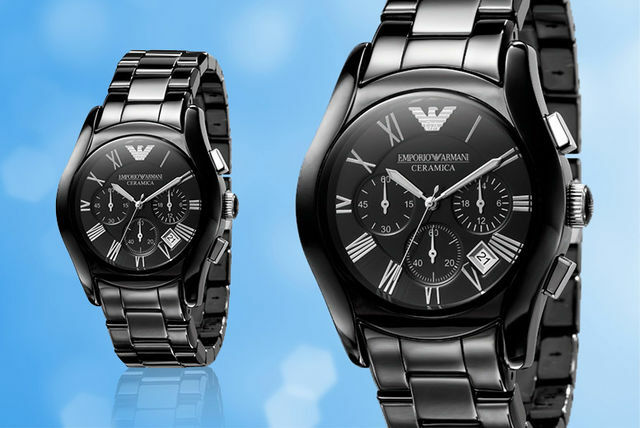 Designed to bring a high-fashion finishing touch to any outfit, this swanky Emporio Armani watch features an all-black ceramic-effect design with stylish silver accents. Whether you’re buying it for yourself or for the fashionable fellow in your life, this is sure to be a timely treat! This stunning watch has a jet black case with contrasting silver accents. Plus silver Roman numeral markers. As well as three separate chronograph subdials and a date display function. 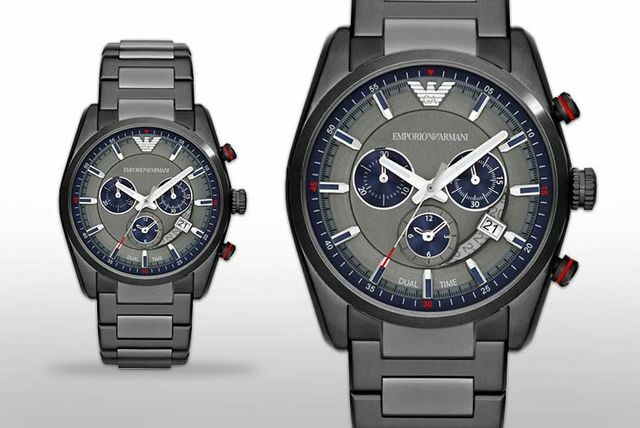 Finished with the Armani logo – a great gift for the modern man about town! 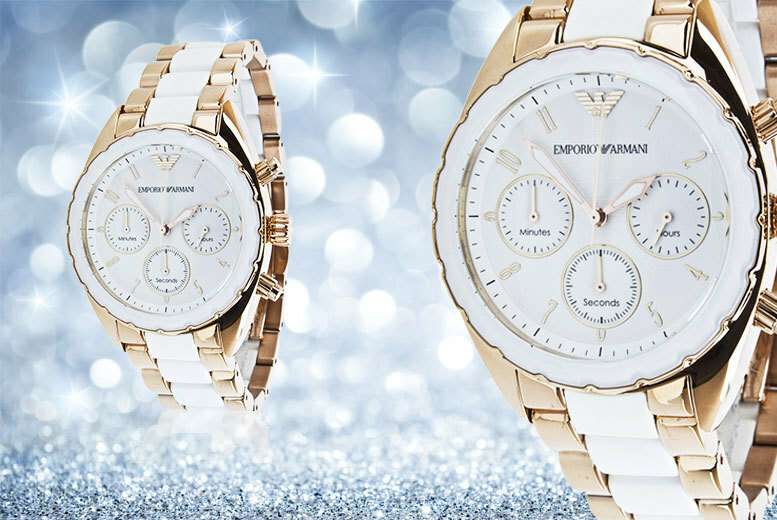 In a stunning white and gold design, this ladies’ watch is embellished with the eye-catching Armani logo and comes presented in a beautiful box with a two-year retailer warranty. Each wonderful watch is water resistant to 50m and runs with super smooth quartz movement. Treat your wrist to an Armani watch. Gorgeous white and gold design. Plus a two-year retailer warranty. Water resistant to depths of 50m. 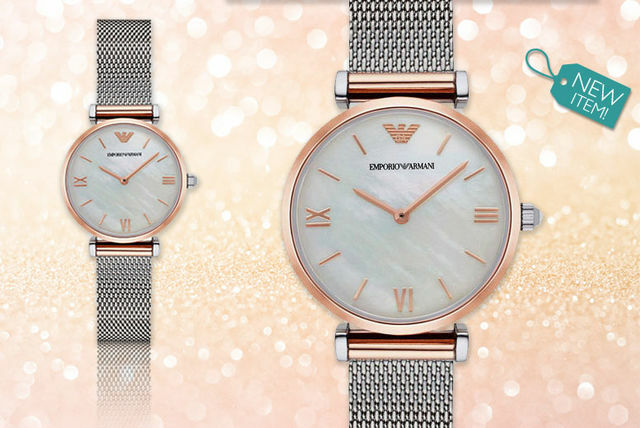 Tell the time in style with this gorgeous Emporio Armani AR0680. It has a stainless steel case and clasp-lock bracelet, and comes in a presentation box with a watch cushion, making it the perfect gift for any stylish man. 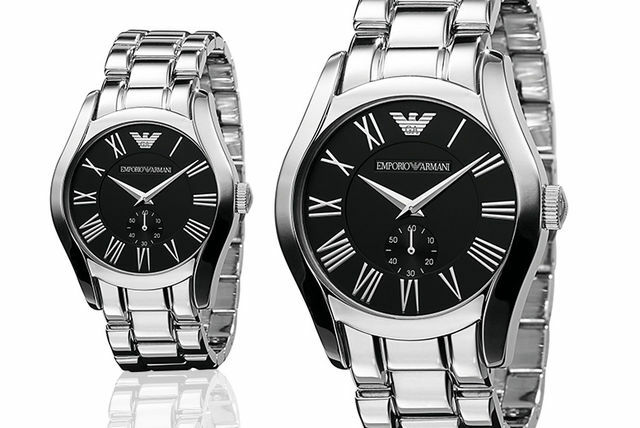 Get a stylish stainless steel men’s Emporio Armani AR0680 watch. Classic design with sleek modern features. Black display with white Roman numeral features and subdial. Stainless steel bracelet with a clasp lock. Comes in a presentation box with a watch cushion – the perfect gift for a stylish man! A perfect gift for a special person, this watch also comes in a lovely presentation watch with a watch cushion as well as a two-year retailer warranty. Perfect! 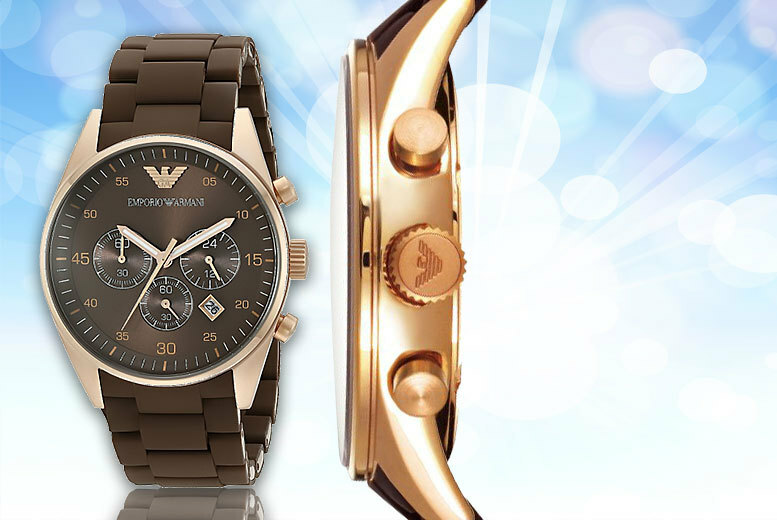 Get a stylish men’s Emporio Armani AR6037 watch. Tell the time in style. Sleek modern design makes a great everyday accessory. Comes in a presentation box and watch cushion – a great gift! With a two-year retailer warranty. 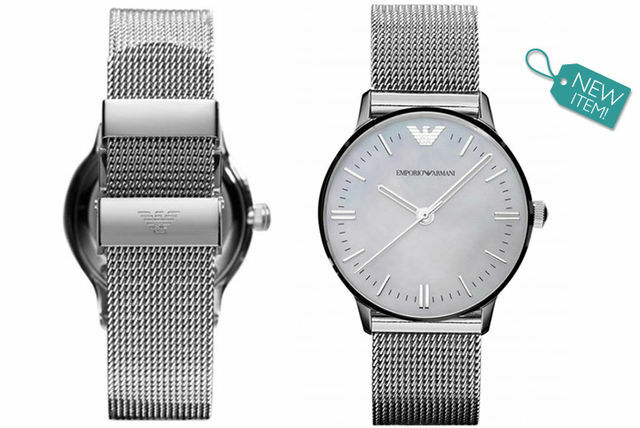 Stylish and functional, this sleek Emporio Armani AR5890 watch is all you’ll need to keep your style game on point. Featuring a brown silicone bracelet and steel casing, this beautiful watch features sophisticated rose gold-coloured accents to complete the palette. 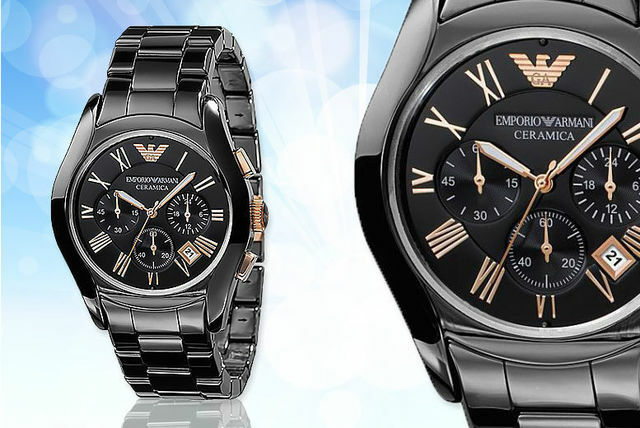 Get an Emporio Armani watch. 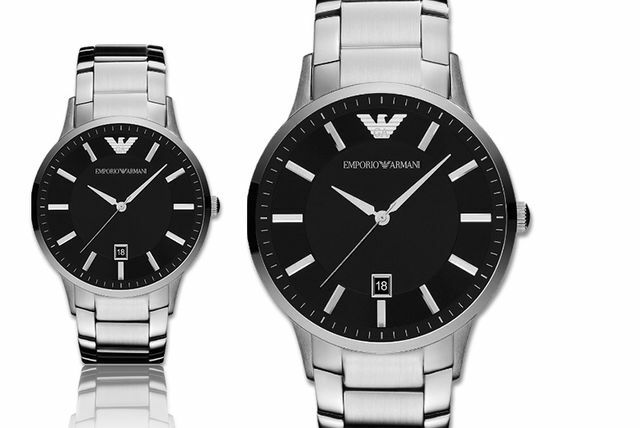 Features three subdials, a date window and the Armani logo. With a brown silicone strap and sleek rose gold accents. Secured in a steel casing. Water-resistant up to 50 metres. Makes a wonderful gift for him or her! 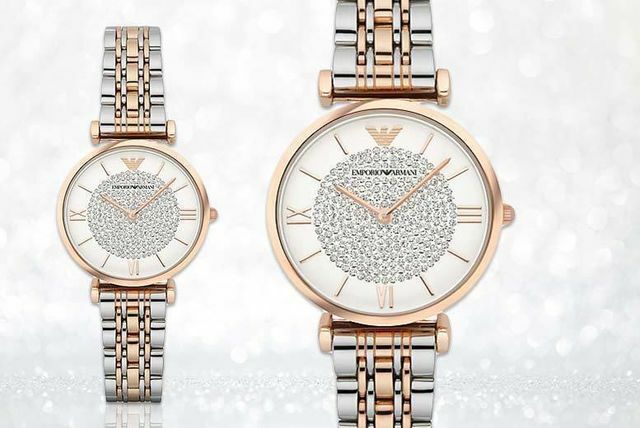 Invest in the ultimate arm candy this season with this elegant Emporio Armani watch. Adorned with a cluster of dazzling diamantés on the analogue dial and Roman numerals circling the outside for a premium touch, this stunning watch is powered by Japanese quartz movement and is water resistant up to 30m, ensuring that it will stand the test of time. If you’re looking for a classy new wrist accessory for a great price, look no further! The sleek and minimalist black dial with silver markers will look perfect with a suit or shirt, or even have way to spruce up your casual wear. Emblazoned with the signature Armani logo and coming with a smart presentation box and two-year warranty, there’s no reason not to snap this one up! Get an Emporio Armani AR2457. Sleek and minimalist black dial with silver markers and date window. Emblazoned with the signature Armani logo. Solid and durable metal strap. Comes with a presentation box and two-year warranty. The perfect accessory for a classy man!